This is a comprehensive guide to everything you want to know about handlettering. If you have thought about trying this form of artwork out, or are too scared to try, check out this guide and feel more confident in trying! 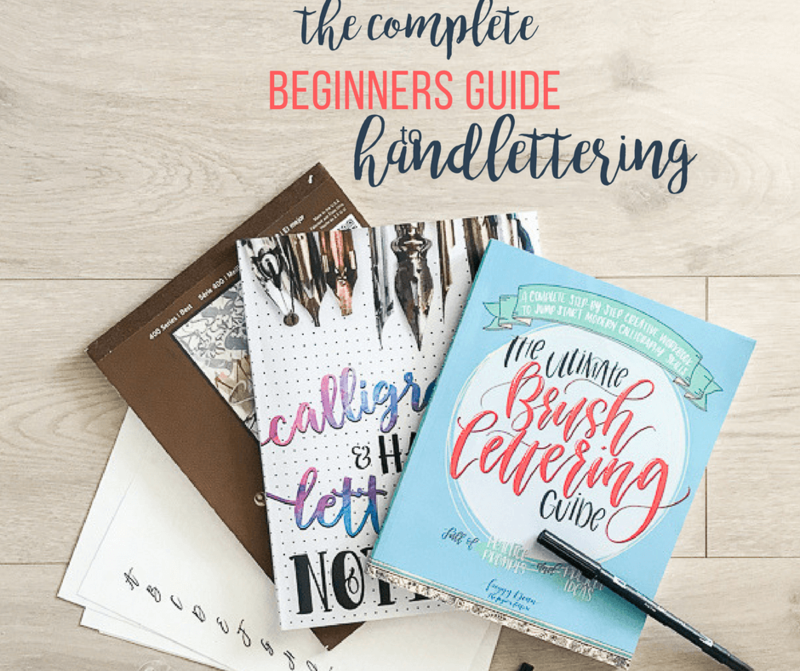 Try out my complete beginners guide to handlettering 101. 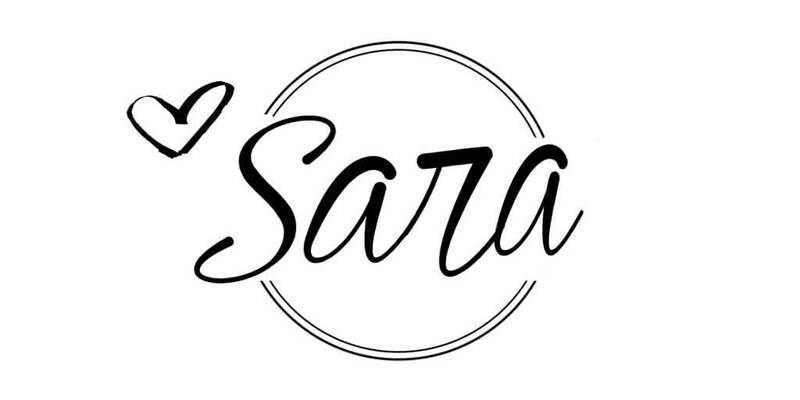 About 6 months ago, I but the bullet and decided I wanted to learn about handlettering. I have always been slightly obsessed with this form of artwork. I remember my mom put me in a calligraphy class when I was a young girl. I spend hours writing fancy letters and words, and I think, maybe that prepared my to try my hand at hand lettering as an adult. Now, I want to leave a disclaimer, that I am not an expert, but I have found a few things that I really like and would love to share them with you. In my opinion, there are many benefits to anyone trying their hand at handlettering. Even if you feel like you are no good, have shaky hands, or can get those upswings right, this is a great activity for so many! Think about how beneficial and popular adult coloring books are. This is a similar activity. On days when I am particularly stressed or feeling low, spending even just 15 minutes practicing this can calm my brain, and reset myself. Maybe try this instead of binge eating that cake, or binge watching that show. Now, there’s no reason why you couldn’t eat that cake and watch that show while learning to handletter. Its called multitasking. When I am feeling creatively stumped, handlettering can push your creative brain just a little bit more. It may inspire you to begin and create a totally different form of art, or project, or it may inspire you to handletter more. Take some of that newfound talent and create something fun for a friend or family. I recently made some pretty signs for a nieces wedding. Doing something nice like this for others can be a huge gift to them, where it may be considered small potatoes to you. Let me stress this. 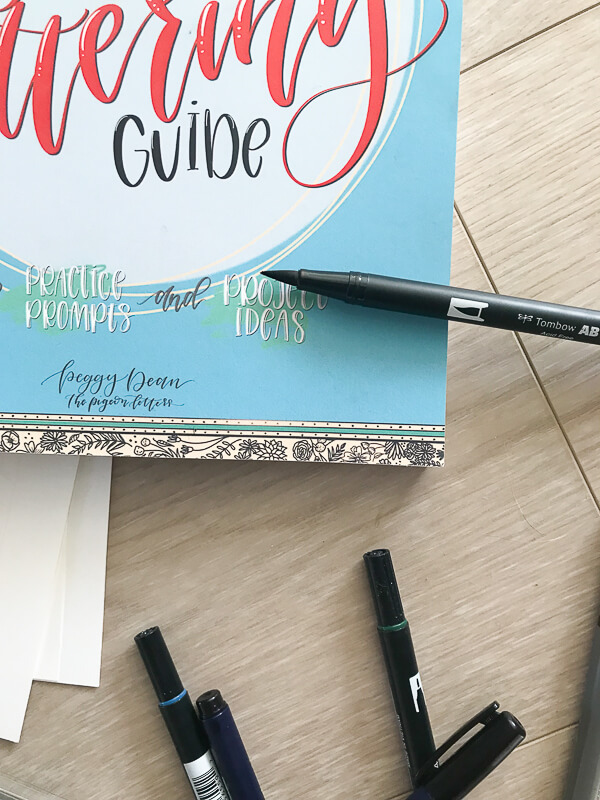 With a good hand lettering brush pen, a good pad of paper, and a practice book or worksheet you can be on your way! There is not a lot of investment in this practice. Okay, now that you have seen the benefits to learning this great skill, lets talk about how to set yourself up for success with my favorite supplies. The most important items you will want to invest in are handlettering pens, (also brush pens), and a good pad of paper. The best brush pens for handlettering in my opinion are Tombow Dual Brushpens. These are great for beginners, and more experienced writers. I love the versatility of these pens. The come with a large brush tip on one side and a smaller, more detail tip on the other end. One other great quality of these is that they come in so many assorted colors. I gave purchased 2 of their multicolored packs. 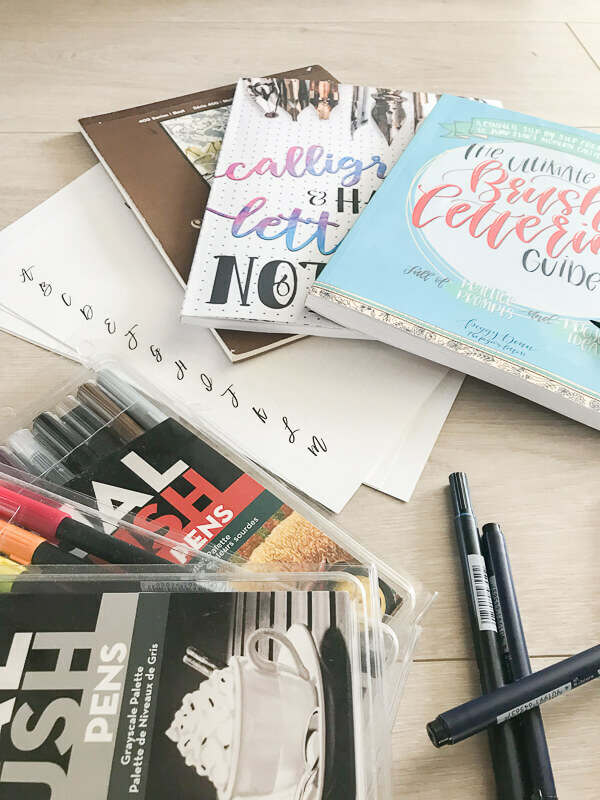 Muted Tones Set – I really like this set, it has 10 pens with muted tones from green to red, which make it fun to create a soft look with color and not overpower the page. Dual Brush Grey Scale – This has 10 different pens all with a different scale of black or grey. I have these and I love them. This is one that I purchased and it was really heplful! I have been advised on many occasions to now use plain copy paper to practice on. I have heard it breaks down the fibers in your brush, and that they will not last as long. These are great to start out with. Just grab one or maybe two! You will be surprised how quickly you will go through them. I am using the back side of all the pages now, since I ran out of space. If you want to hear a little more, check out this Facebook live I did a few days ago. It shows all the supplies I currently use. In addition to the supplies I have listed above there are also many FREE practice pages you can find on Pinterest. This printable by One Artsy Mama is a great way to practice handlettering each letter in the alphabet. She also has some basic brush stroke pages, and other helpful tips. 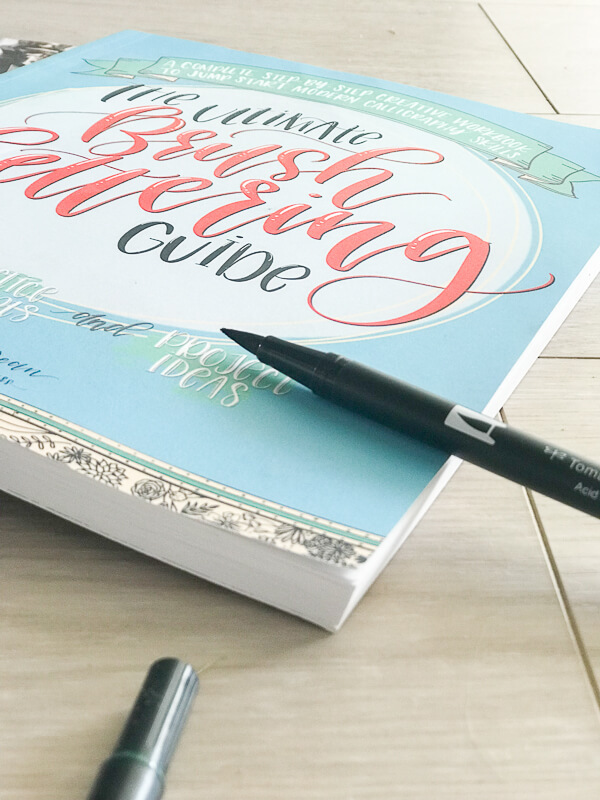 Here is a free ebook on hand flourishing by Dan Nicole, which can make your lettering so much better! Free handlettering sheets from Liz On Call are great to get those letter consistent! And stay tuned, because I am creating some hand lettering practice sheets of my own! Now, get out there and try it out for yourself! This is such a fun hobby and can turn into so much more! Thanks so much for stopping by. Make sure to check out my Facebook page to see whats going on day to day. You can also see what I am pinning on my Pinterest account. Popping over from TTT Link Party. I admit I’ve been curious about handlettering. Love your starter guide!